Thanksgiving is less than two weeks away and some of you might be biting your nails trying to figure out how to cut the calories, fats, and sugar out of the traditional meal without sacrificing flavor, color, texture and general appeal of your dishes. Although it is nearly impossible to make every traditional Thanksgiving dish light, here are a few recipes and tips that’ll help you and your family cut the unnecessary decadence without making your dinner bland. I try to cook using as little fat as possible which is why I invested in some incredible nonstick pans. If you don’t have a good nonstick pan, do not worry. The recipes below have measures of olive oil that are labeled “optional”. Those “optional” measures of olive oil are for those who don’t have access to a set of good nonstick pans. If you are watching your sodium intake, you can cut the salt ratio in half for the dishes that are using lemon juice and lemon zest. Chances are you won’t miss it much. However, I would not alter the turkey brine. Thanksgiving wouldn’t be the same without the star of every dinner—the turkey. 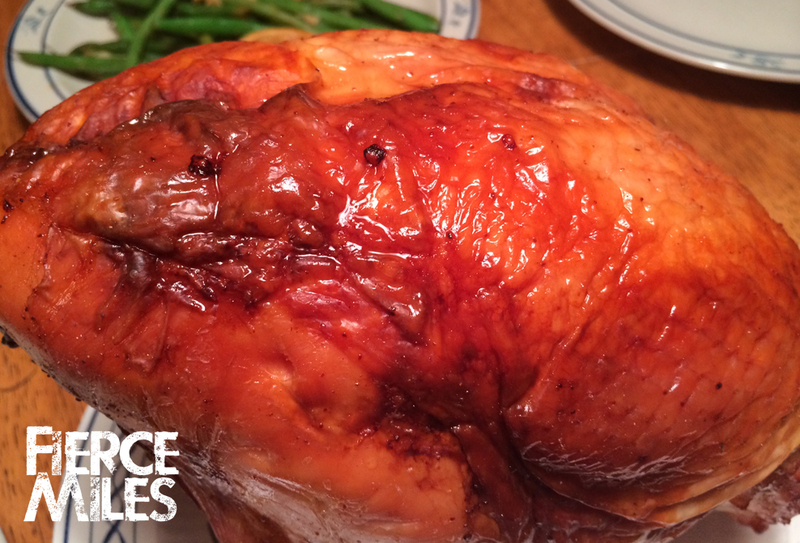 Here is my fabulously simple recipe for the most delicious and moist turkey you’ll ever eat! I have to put a disclaimer here, give yourself at least 24 hours after the turkey is fully defrosted to properly prepare and treat the bird. Wash and clean the turkey breast. Take care not to cut or puncture the skin. Set the bird on a wire rack of a regular roasting pan to drain. In the meantime, combine water, salt, and lemon juice and stir until the salt is completely dissolved. Fill a marinade injector with the brine. Find a few places on the breast that do not have skin and inject the brine. Usually, one 30 ml injector full of brine is enough for a 6 lb. turkey breast. Discard the leftover brine. Combine soy sauce and chili powder. Mix well. Using a basting brush, brush the soy sauce mixture on your turkey. Set the turkey in the refrigerator, uncovered for 12-24 hours. After the turkey spent at least 12 hours in the refrigerator, preheat your oven to 325 °F. Stuff the cavity of your turkey with rosemary sprigs, thyme, and a halved tangerine. Cook your turkey uncovered for 2.5 hours or until the meat thermometer reads 170 degrees. You shouldn’t have to baste or treat your bird in any other way. The skin is going to be golden brown and the inside extremely juicy. After the turkey is done, cover the bird with foil and let it rest for 10-20 minutes before serving. Preheat the oven to 325 °F. Cut the bread into ½ inch squares and set aside. In a large bowl combine olive oil, salt, Italian seasoning, sage, and the bread. With your hands, gently toss the bread in the mixture until all cubes are evenly coated. Place the bread on a cookie sheet and bake for 15-20 minutes or until the croutons are crispy. Allow to cool, pulse in a blender or a kitchen processor until the bread is about pea sized. In a nonstick pan combine diced onion, celery and mushrooms. Cook until the mixture has reduced by about a quarter or until the mushrooms are gold and onions are lightly caramelized. Add the Chicken Broth and bring it to a gentle boil, add in the cranberries, wait until the broth mixture is boiling again and add in the bread. Stir gently to incorporate all of the ingredients, turn of the heat and let the mixture rest for a minute or two before serving. 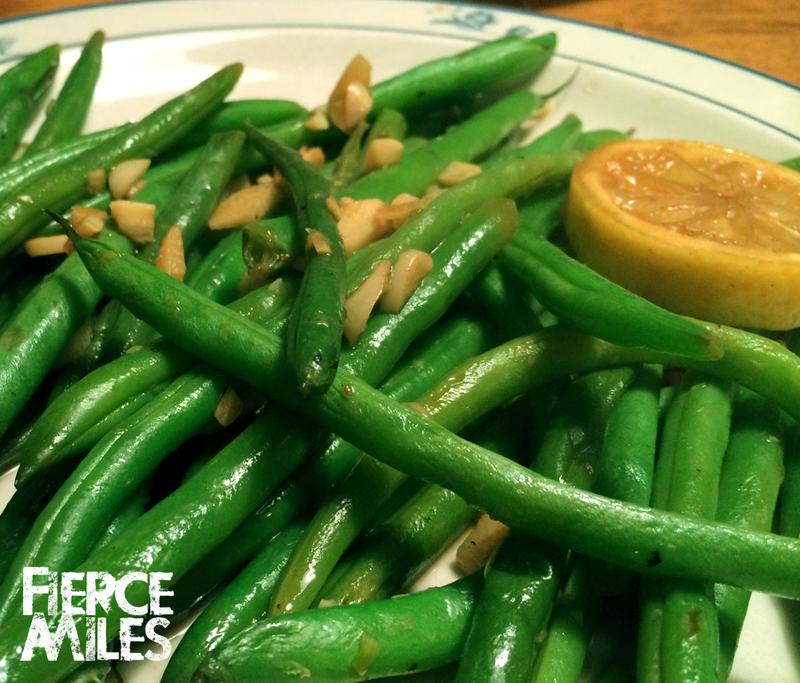 Combine green beans, lemon juice, pepper (optional), salt (optional), and minced garlic. Cook stirring occasionally until green beans are tender. Garnish with lemon zest and serve. Preheat the oven to 325 °F. Wash, clean, and cut the squash into wedges. In a small bowl combine the oil, rosemary, chives, and lemon zest. Arrange your squash wedges in a baking dish and brush them with the herb mixture, add salt. Bake for 30 minutes or until tender. Beets may not be your first choice when it comes to getting the most vitamins, minerals, and antioxidants, but they might just be what you need to ward off that evil flu. Some studies show that consuming raw or lightly cooked beet root may increase your immunity, decrease muscular inflammation, promote digestive tract detox, as well as significantly decrease risk of certain cancers. But even after all of that, most people would never choose to eat a beet willingly. Well, below is a new take on an old Russian recipe that is guaranteed to change your mind about beet root. There are a few additions, substitutions, as well as modifications that you can do to this beet root salad to meet your nutrient needs. For example, you may want to substitute a green onion, or a Texas onion for a red onion. You can also substitute Edamame instead of peas and toss in some herbs like parsley or basil to brighten up the flavor and take you into a whole new direction. Cut the green and the root of off your raw beets, wash and peel the outer skin. In a medium size pot bring the beets to a boil. The water should cover the beets by about ½ an inch. Cook the beets until they are tender but not mushy. You want the beets to have a little bit of crunch. About 15-20 minutes. 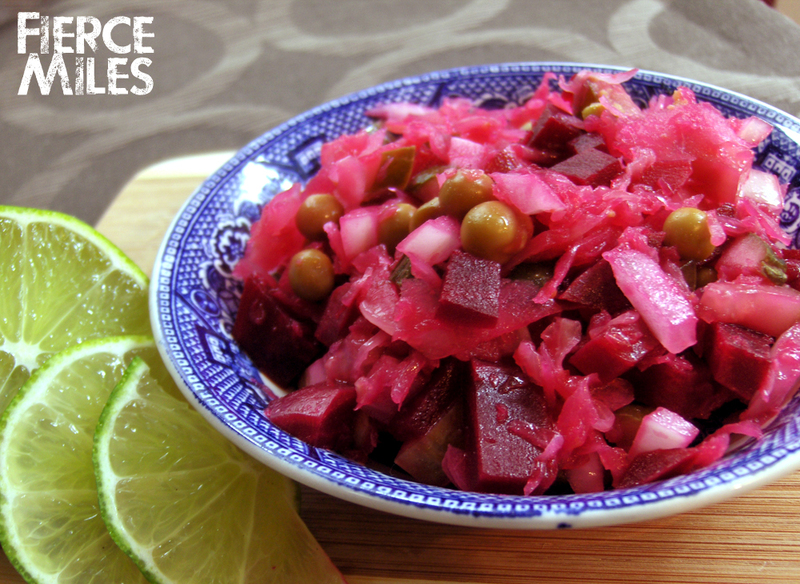 While your beets are cooking dice the onion and combine it with sauerkraut, olive oil, agave syrup, and lemon juice. Mix well and set aside. Let the flavors combine while you finish cooking your beets and dicing them. Wash, clean, and steam your peas (if you are using fresh peas) or drain a can of your favorite pea variety, dice two medium sized pickles and set them aside. When the beets have finished cooking, dice them into bite sized pieces and combine them with the rest of the ingredients. Toss, salt to taste and serve. 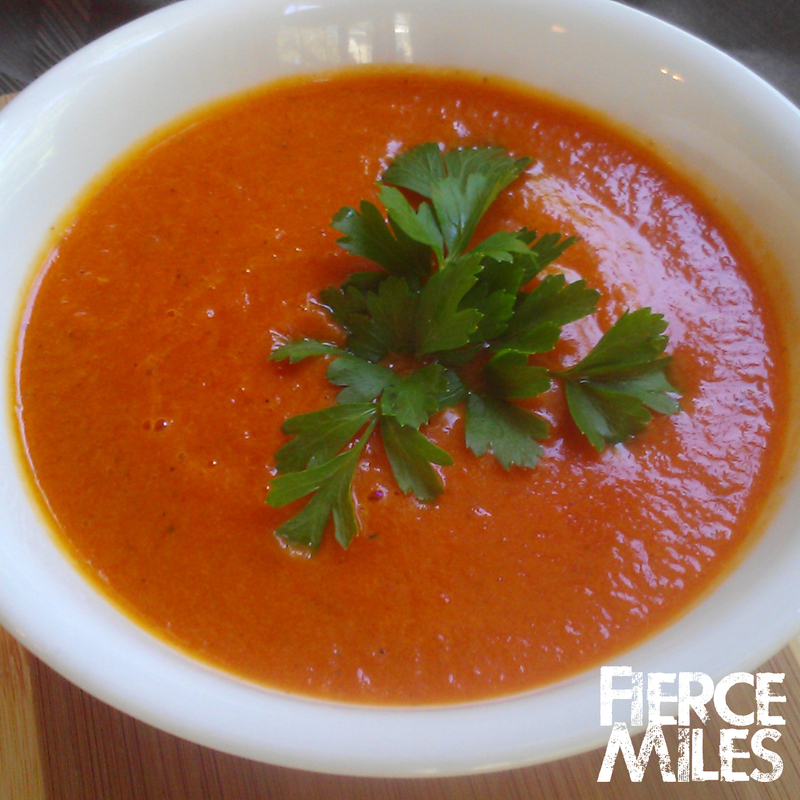 It is most definitely soup weather and nothing warms me up better after a long run than a nice bowl of rich and creamy Roasted Red Pepper and Acorn Squash Soup. It tastes like comfort and packs a serious nutrient punch. It is easy and fairly quick to make especially if you have chicken or veggie broth on hand. I prefer to make my own broth and roast my own peppers, but you can use store bought if you are strapped for time. 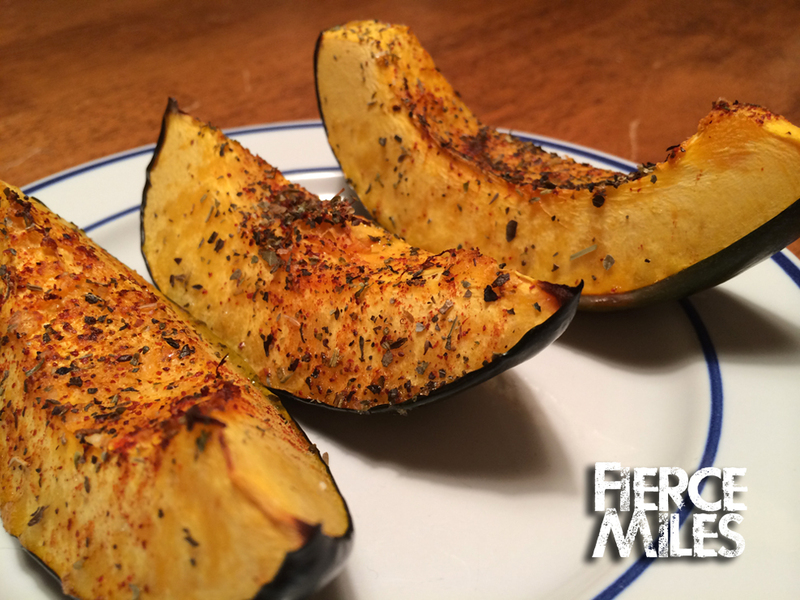 Preheat the oven to 350 degrees, peel and cut Acorn Squash into a few pieces, coat with olive oil, rotisserie seasoning, and salt and bake for 25 minutes or until tender. In the mean time, roast peppers on the hot grill until the skin blisters and chars. Put the peppers into a large bowl and cover with aluminum foil. Allow to rest for 10-15 minutes. After the peppers have rested, peel the skin (it should come off pretty easily) and take out the seeds. Cut the peppers into small strips. In a medium sized pot, combine the remaining spices and 2 cups of broth. Add the squash and the peppers and simmer for 10 minutes to combine the flavors. Allow the soup to cool and blend in a blender until silky smooth or use an immersion blender to do the same. Garnish with your choice of toppings and enjoy! 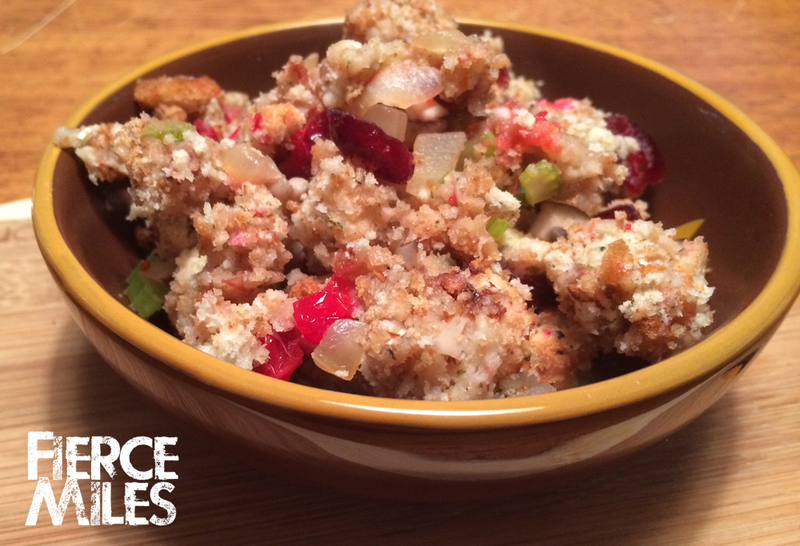 If you are busy, busy, busy just like we are, this recipe is a life saver! 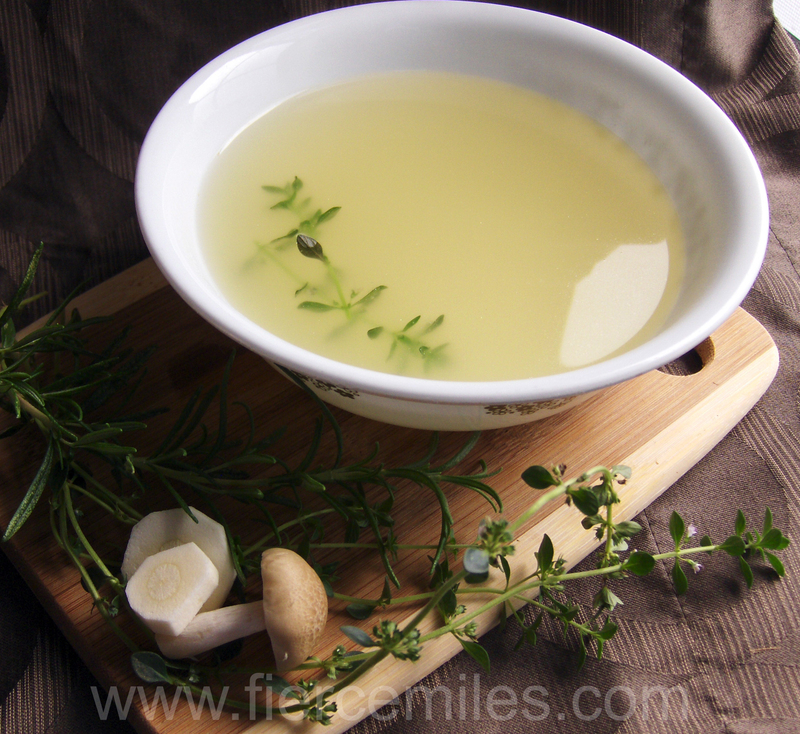 This broth can be added to a lot of dishes to enhance the flavor or to prevent proteins from drying out during the cooking process without sacrificing any of the flavor. The best part is, that you can portion this broth in 1 cup Tupperware containers and freeze it so when you need exactly one cup of broth for one dish or another, you always have some on hand! Clean and trim the chicken breasts, set aside. Clean your carrots, celery, parsnips, and herbs. Peel the onion without cutting it in half, it’ll be easier to fish it out of your broth later. Tie the herbs up with butchers twine and set aside. In a large broth pot, combine water, chicken, and veggies, add the spices, cover and set on medium heat. When the broth starts to boil, about 10-15 minutes, add your herb bunch and cut the heat to low. Allow the broth to simmer at low heat for another 35 minutes or until chicken is done. With a slotted spoon take out all of the veggies and chicken. Reserve the chicken for Chicken Mushroom Soup or other meals. At this point you can save the broth in order to use it in other meals or make Chicken Mushroom Soup. I usually allow the broth to cool and ladle it into 1 cup Tupperware containers and freeze for later use.